Known for including free dedicated IPs with their shared hosting accounts, IX Web Hosting has been providing low-cost hosting for more than 15 years. And while the IX website has been redesigned a number of times, we have our doubts as to whether or not their network and servers have been updated as often. Their services include a good number of excellent features, but IX falls short in two key areas — server speed and uptime. There are certainly other important aspects of hosting, but ultimately a great deal of our judgment must rest upon page load times and server reliability — areas in which IX is found wanting. IX Web Hosting has earned the NCM Online designation of NOT RECOMMENDED. IX Web Hosting offers three affordably-priced shared hosting plans: Expert, Unlimited Pro, and Business Plus. All include unlimited disk space, bandwidth, e-mail accounts, and hosted domains. 1–15 dedicated IP addresses and 1–3 domain names (depending on the plan) are provided free of charge. All IX plans are backed by 24×7 phone, chat and e-mail support, as well as a 30-day money-back guarantee, a 99.9% uptime guarantee, and an A+ BBB rating. For customers with ecommerce requirements, SSL certificates are available for all three plans at an added cost of $49.95 per year. The checkout process is fairly simple, however as of May, 2014, IX is doing split testing on a new site design, so you may see the 1-page sign up form (no form field to enter domain name), or the 2-page sign up form (enter domain to be associated with the account on the first page). One thing we definitely did not like about the sign up process is that the SiteLock option is automatically added to the shopping cart. We feel that this is a deceptive business practice. If customers want to purchase SiteLock, they should be able to add it to the shopping cart by choice. As is our practice for review and testing purposes, we selected the lowest-cost Expert plan, unchecked the SiteLock option, and proceeded to checkout using PayPal. Within 1-minute of receiving the PayPal receipt. The first of two “Welcome” e-mails arrived in our inbox. While it did not contain all of the information necessary to set up our test site (click for sample test site). It did include a link to the control panel. Six minutes later, the second “Welcome” e-mail arrived in our inbox. It included our free dedicated IP address, FTP login info, and nameserver settings. While it did not include e-mail settings, we had enough information to upload our test site quickly without having to login to the control panel. 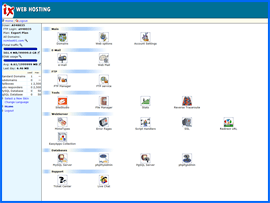 IX Web Hosting control panel. Click to enlarge. It should be noted that the control panel link in the “Welcome” e-mail leads to the account dashboard and not the control panel. Once you have logged into the account dashboard, you may access the control panel by clicking on the “Manage” button below the Linux penguin icon. IX utilizes a proprietary control panel (see screenshot right). While not as user-friendly or fully-featured as cPanel or even vDeck, it is workable. To install WordPress click on the “EasyApps Collection” link in the “WebServer” section. Note that IX utilizes a proprietary script installer for adding CMS (content management system) applications to your website. IX Web Hosting Speed Test Results Chart. Click to enlarge. All web hosting services reviewed by NCM Online are purchased and subjected to our 10-day test for uptime and speed. 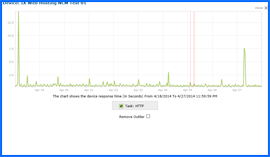 IX Web Hosting speed and uptime testing began April 18th and was completed on April 27th. Speed testing results for our simple 1-page test site were well below average (see speed test results chart right). Site speed was fastest when accessed from Colorado with a page load time of 1.4644 seconds. Site speed was slowest when accessed from Hong Kong, recording an average of 2.0972 seconds to load our test site. IX recorded an average speed of 1.9569 seconds to load our test site from 13 locations worldwide, and 1.6087 seconds from 7 U.S. locations. Overall, IX produced the slowest page load times we have recorded to date. Needless to say we were quite disappointed in the results. IX Web Hosting Uptime Test Results Chart. Click to enlarge. While we would prefer not to dwell on negatives, when tested for uptime every 15 minutes over 10 days, the reliability results proved to be equally disappointing (see uptime test results chart right). The server began experiencing problems on April 25th at 2:51 AM EST when 23 attempts to access our site from various locations worldwide failed. The problem continued for about 15 minutes. At 6:00 AM EST on the 25th, the server experienced additional problems that lasted for more than 22 minutes, during which time we were unable to access the test site from 8 locations. 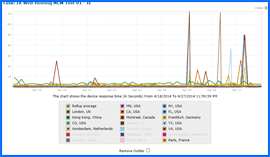 At 6:38 AM EST, still on the morning of the 25th, the server once again began actively refusing connections from multiple worldwide locations (TCP Error 10061). In all, IX Web Hosting produced a well-below-average (and less than guaranteed) 99.7884% reliability score. While there is a lot to like about IX Web Hosting, we have little use for slow and unreliable website hosting services. We cannot in good conscience, recommend them to our readers. IX Web Hosting has earned 3.5 stars and is not recommended by NCM Online. Cheap website hosting company price comparisons based on 1-year term list price before coupon/promo codes or limited time/introductory offer discounts. These are the renewal rates for the second year of hosting. To ensure that you receive the most affordable IX pricing possible, please visit our Web Hosting Coupon Codes page for current discounts and special offers before making any purchases. IX Web Hosting started as a humble company in 1999, hosting its first clients from a home server in a living room. Today the company is a successful and growing provider that has over 110,000 clients and hosts more than 500,000 websites. IX wants to build its reputation as the best in the industry by providing exceptional support to its customers. The company has adopted a philosophy that each customer is unique and should be served in a personalized manner. This philosophy has led to the creation of a satisfaction-based client support program. Clients won’t encounter scripted or push-button customer representatives. The firm does not evaluate its support reps based on how many calls they can fit into one day. The only thing the company asks of their reps is to solve the customers’ problems and make them happy. As a result, the company provides a diverse and friendly workforce that does everything it can to assist customers with all of their individual issues and questions. Many webhosts offer their customers a 30-day money back guarantee, but IX also offers its clients a completely free hosting trial. For seven days customers can try out the services and see how they fit their web-hosting needs — all for no charge. There’s no credit card or debit card billing until after the 7-day trial period. There’s no need to read the fine print or fight for a refund. A customer can cancel before the end of the seven days and never receive a bill. Customers want a web hosting firm that keeps their websites online and accessible to the web. Some hosting companies advertise that they provide 99.9% website uptime, but don’t explain how they back up that claim. IX Web Hosting helps ensure the maximum uptime for its clients’ websites through its Tier 3 (n+1) redundant center for data. This system provides a backup for all customer data. If one server’s power source fails, an extra power source automatically activates. The company is prepared for extended commercial emergency power outages. It has two backup industrial diesel generators capable of operating for 24 hours. Customers that join IX Web Hosting join an interactive community of over 110,000 experienced website builders that they can access through social media such as Twitter, Facebook, and a technical status blog. Clients don’t just get hosting, they receive access to tools that guide them through the steps needed to build and maintain a successful website. These tools include easy-access web tutorials. Clients get a complete support program that provides them with the key elements they need to build and grow successful websites and online businesses. This video tutorial demonstrates the installation of WordPress on an IX shared hosting account using their proprietary control panel and applications installer.